As mentioned briefly on my last What I Ate Wednesday post, I broke up with my boyfriend of nearly 2 years (1 year and 8 months) on Labor Day. It was NOT easy. Not in the slightest. The truth is, I think this is just the best thing for the both of us. Even if he doesn't realize it right now, there is someone better and more perfect for him out there than me. He and I are just two different people. I have changed completely since we started dating and now am now a totally different person. I can't help it. But I'm proud of who I am now and, although this decision was a tough one, I have to hold my ground. I've been praying about what to do for a while now. I've been asking God to show me what He wants me to do with my life, and although I think there have been obvious signs of God telling me to do this, I haven't exactly been the best listener. I had my entire life planned out: getting married, having kids, where we would live, and how we would build our house from the ground up and be rather wealthy from his aerospace engineering job. The truth is, I'm really scared of giving up that plan. Now my future is unsure and I don't know where I'm going to go or what I'm going to do. 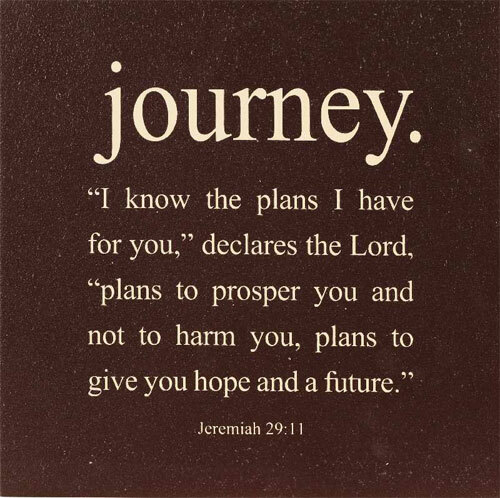 However, I do know that God has a plan for me. Which is why I decided to do something that I have never done before. I've decided to take a leap of faith and jump into the unknown. It was while reading and praying over this passage that I decided to take that leap of faith into the unknown. Yeah, I don't know my future. And I'm really scared about that. But I know that God has a plan for me, and to find out what that plan is, I need to give up the plans I had for myself. I want to be loved. I want to be held. And kissed. And given flowers and taken out dinner. But these things aren't worth it when you realize that you have to keep trying to make yourself be in love. I love him, but I've changed. I'm not a party girl. I'm not super liberal anymore like I used to be. I want to be true to myself and to God. I feel this is what I should be doing. I type this now as I'm really struggling to cope with the situation. I want life to go back to being easy and fun and carefree like it was when we first started dating. I want him in my life. He's a good guy. But this is not where I want to be in life. I need to take time for myself to explore my feelings, meet people, and be carefree again. No more worrying or fighting or pretending. Just me, being myself. Eventually, we will both heal from our brokenness. It WILL take a LOT of time. But I'm willing to take that time. It is necessary in all things. I hope we can still be friends, but if that's what will hinder us from healing, then I'm okay (well, not really, but I'll be okay with it eventually) with putting our friendship on hold. We need to do what we need to do. On Tuesday, my friends Elizabeth and Stephanie took me out to Yogurt Vi for frozen yogurt/sorbet. It was delicious. And I needed some time away to focus on friends and having fun. Then we went shopping at Urban Outfitters, AKA BEST STORE EVER. Also very expensive, but still awesome. I bought new nail polish! These two colors plus a dark purpley color. Sooo pretty. My new favorite shoes. I love them. They are like the cheap version of adorable slip on Keds. Plus, they are yellow. And have flowers. Double win. but they are really comfy and totally worth the 2 for $20 price tag. My second pair of mary janes! All my pretty bottles of nail polish! This whole experience has definitely taught me who my friends are. The people who care the most. The people who hugged me and let me cry to them and vent about my feelings. The people who ate lunch with me to ask me how I'm doing. The people who knew, even from me just walking into the room, that I was not okay. I love my friends. Make sure you know who has your back. They will be the ones who are there for you for life and will help you through the rough times. In the end, that's all you can ask for: a support group, your strong foundation to keep you grounded. Stay true to who you are. It's tough, but it's the right thing to do. change can be a wonderful thing once you are ready to embrace it. I'm so sorry to hear that you are going through a rough time. Don't give up hope. Stay strong, it'll get a little easier with time. its so hard not to go running back to him, even though i know ill just end up getting frustrated again if i do. Hugo BossOn the design style, they are neither traditional nor the trend, a good combination between but, the clothing rarely seem to with the fashionable word. His flagship brand Georgio armanni, Giorgio Armani for the wealthy class, Mani, Mani, Emporio Armani Emporio Armani, armani jeans armani jeans for ordinary consumers. Founder: Giorgio Armani Giorgio Armani designer small files: 1934 was born in Italy, 1952 - 1953 study medicine and professional photography in 1954 - 1960 La rinascente (Larry NASS worthy of special department store window designers and proofing division.